A tree that gets removed professionally or one that falls on its own is going to leave a big, ugly stump behind. You can just live with it. A lot of people do. 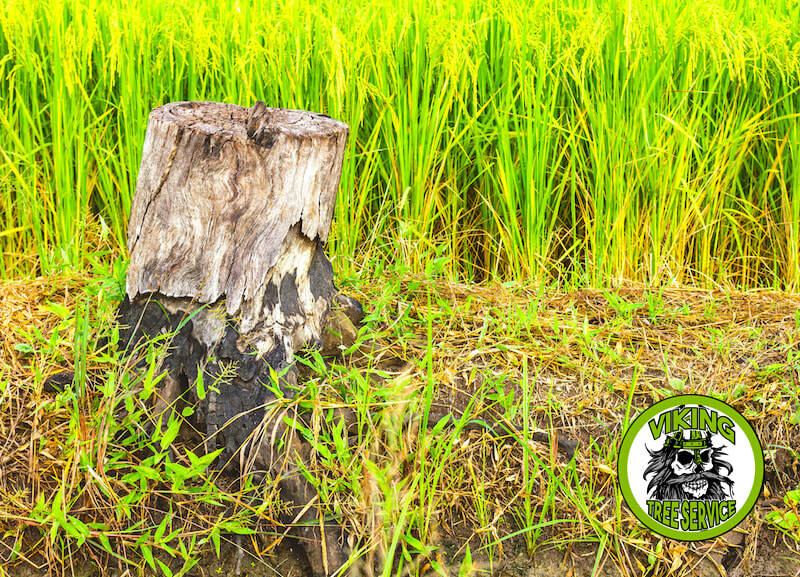 However, if you are interested in getting rid of the stump and restoring your yard to its intended beauty, call Viking Tree Service today for professional stump removal! Why Would You Want A Stump Removed? This is a question you may have asked yourself. If the stump isn’t bothering you, then what real incentive would there be to have it removed? Well, for starters, the stump will take years to decompose. You may not mind it now, but what about in five years when you’re still waiting for the stump to disappear? It’s much easier for our team to remove a stump when it’s in consistent condition, so don’t let it rot for a few years and then decide to have it removed! Let Viking Tree Service go ahead and remove the stump as soon as the tree is gone. Also, the stump can draw all sorts of pests looking for a home. Ants, bees, and a host of other pests can make their home in an old tree stump. This can be a danger to you and your family, and getting rid of them – even when the stump is gone – may be more difficult than you anticipate. If you want to keep these things away, don’t let that tree stump stick around. Finally, a random stump can be dangerous. Not only can a tree stump house dangerous or simply aggravating pests, but it can also be a hazard to anyone or anything in your yard. If it is low to the ground, there’s a good chance that someone could trip and fall because of the tree stump, and if it is near a driveway or parking area, someone could easily drive over it and damage their car. As you can see, there’s no reason to let an unsightly tree stump remain in your yard. Allow Viking Tree Service to take a look at your yard and explain to you the best stump removal method for your situation. We get a lot of questions about this, believe it or not. People who are unfamiliar with the tree service business often imagine us digging up a tree stump with several dozen shovels because they don’t realize that there are other far easier methods of stump removal! Occasionally, we will dig a stump up that way, completely by hand. However, this is a method we’d only use if the tree was very young, with a small root system, or if the tree was situated too close to a structure for us to use any other method. Even then, if the tree is very large, a plain ol’ shovel isn’t going to do the trick! Another method we use, by far the most common way that we do stump removal services, is with a stump grinder. This machine is designed to bite away at the stump little by little until the whole thing is gone. We can even chip the stump down to below ground level so that the hole can be filled with dirt, and grass can grow back over the surface. In this way, we can make it appear as if there was never a stump there in the first place! In the case of very stubborn or large tree stumps, we may also use a backhoe or some other piece of machinery to uproot the entire stump. This method is more common in land clearing, but it is an option in many stump removal jobs. Clearly, Viking Tree Service has more than one way to remove an ugly tree stump on your property, so call us today for stump removal services! We’re fast and professional, and we use the best stump removal equipment on the market today. Once we are finished, you can even use the wood chips that we get from the stump as mulch for your flower beds or around other trees. This can save you a lot of money that you would normally have to pay a landscaper or a home improvement store, balancing out the cost of your stump removal services! If you don’t want the wood chips, we’ll be glad to haul them away for you instead. We always have customers asking us about extra wood chips for their landscaping, so we’ll definitely find a home for them! Quick shout out to our friends at Virginia Beach Tree Service!